ExpertSender recently expanded its offering by adding the SMS channel to its platform. 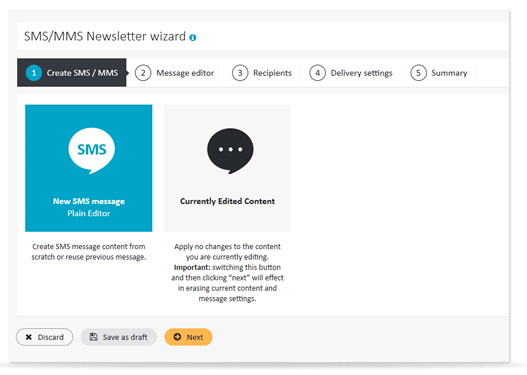 In addition to creating professional email marketing campaigns, ExpertSender customers are now also able to manage and run sophisticated SMS campaigns. This is an important addition to the ExpertSender platform, giving marketers additional arsenal in their marketing mix with SMS marketing campaigns having average open rates of 98% according to a recent Dynmark report. Marketing professionals are now able to create personalized SMS marketing campaigns and leverage an additional push channel in their marketing programs. Wizard example: The ExpertSender SMS/MMS Newsletter wizard. There are a number of advantages to using the short messaging service and it can complement your marketing campaigns in other channels. SMS can be highly personal – customers will only opt-in to SMS with companies they want to interact with. Make them feel special through a highly personalized message. Messages are timely – got a time sensitive offer? 90% of the time it’ll be read within 3 minutes. Marketers can integrate SMS with their ecommerce campaigns – add trackable links to their offers. SMS boosts brand awareness with each touch. Allow your customers to opt into receiving SMS updates via a form on your website. It’s simple, to the point and gets the message across instantly. Segmentation based on marketing channels allows for the grouping of subscribers based on the channel which can be used to contact them. For example, marketers could select all the subscribers that can be contacted through both SMS/MMS and email, allowing them to run a multichannel campaign. Send your customers promotional offers via an email newsletter and follow up with a promotional code via SMS a day or two before the promotion ends. Segment example: selects subscribers that can be contacted via the SMS/MMS channel. 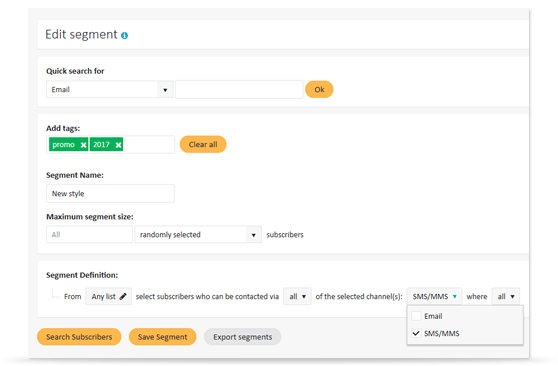 In addition to segmenting subscribers based on their channel preferences, customers can segment their subscribers using ExpertSender’s segmentation mechanism. 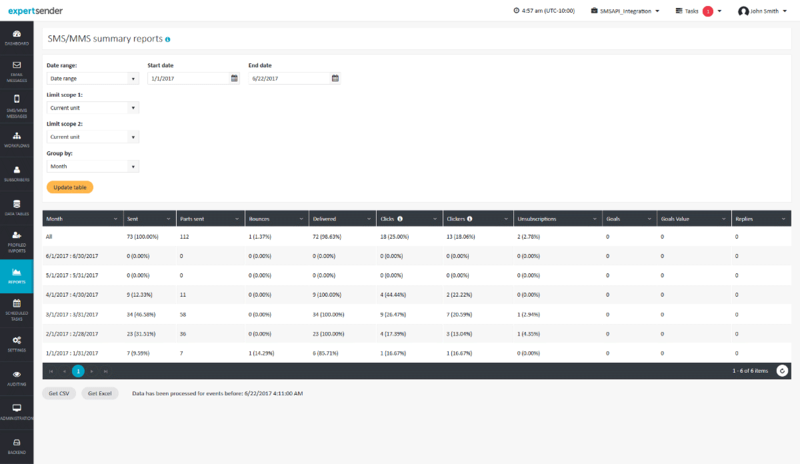 This includes, segmentation based on a subscriber’s demographics, past transactions, sent campaigns and on actions performed by subscribers after receiving specific messages. Customers can send generic or hyper personalized SMS messages that are sent at a given time to a select group of recipients. Some of the data that can be used to personalize SMS messages includes: name, demographic data, behavioral data, product, transactional and purchase data, customer interests and preferences. 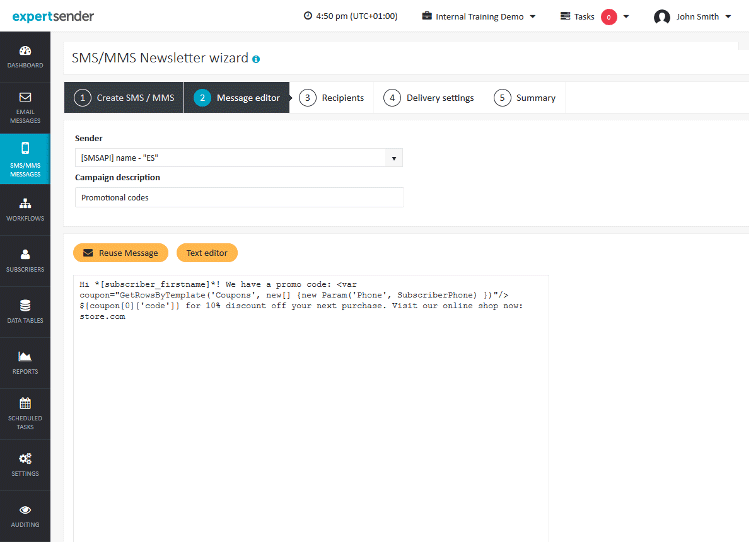 Personalized SMS with dynamic code example: an SMS message in the SMS/MMS Newsletter wizard that will include the subscriber’s first name, and a promo code for a 10% discount. The ability to use custom short links allows customers to save valuable characters in their SMS messages, and track their performance. Customers have SMS/MMS Summary view and individual message reports that detail message performance. They include data on the number of messages and parts sent, the number of bounces, the number of messages delivered, the number of clicks and clickers, the number of customers that unsubscribed, goals achieved, their associated value and the number of replies. Report view example: an SMS/MMS summary report view in the ExpertSender system. Marketing channels can often perform better when they work together and complement each other. With email and SMS, there are a number of ways in which the two can work together. Marketers could, for example, send a follow-up SMS after a series of emails for customers who purchased flights for their latest vacation, reminding them that they have an upcoming flight a day before the flight. If a customer’s phone number is missing, marketers could capture it by running a promotional email campaign that will give them a discount code for their next accommodation reservation. When they send an SMS with an accompanying short-code to a specific number they’ll receive a discount code and you’ll capture their phone number (be sure to explain what this will mean for them and what you’ll use their number for). Furthermore, you could also include a link to your website where they can redeem their discount code, adding another marketing channel into your mix. The SMS channel is available upon request to all ExpertSender customers as of the latest release.